No dump truck delivers more payload than a Strong Superdump®. The Strong Arm is a load-bearing axle that is added to the rear of heavy-duty trucks (i.e. dump trucks, concrete mixers, garbage trucks), and travels a significant distance behind the truck to greatly increase payloads (and profits) while operating in compliance with federal and state bridge laws. Also know as a stinger, booster, trailing tag, or flying tag axle, the Strong Arm trailing axle has revolutionized the trucking industry. In accordance with federal and state bridge laws, a truck's allowable gross weight is based on the number of axles supporting the weight, and the overall distance from the first axle to the last. Spreading the truck's weight over more axles and/or more distance increases the allowable weight of the truck. The Strong Arm adds an axle to the to truck, but more importantly, unlike typical auxiliary axles like pusher axles (aka lift axles or belly axles), the Strong Arm also adds 11 to 13 FEET to the truck's axle length (or bridge length) when it's deployed, which greatly increases the truck's allowable weight compared to other auxiliary axles. The addition of a Strong Arm trailing axle to any truck will increase it's allowable weight by as much a SEVEN TONS when it's deployed. The Strong Arm is equipped with steerable wheels, and doesn't need to be lifted to navigate turns or road grade changes enroute to the dump site. When at the dump site, and whenever the dump body is empty, the Strong Arm stows neatly above the body, out of the way, and the truck then has the maneuverability of a simple tandem truck. The Strong Arm is the only trailing axle that doesn't interfere with normal dump truck operations. 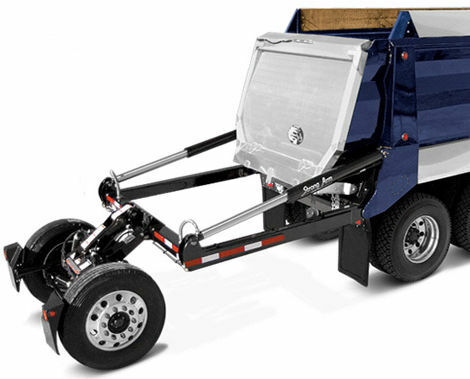 The patented feature of the trailing axle rotating up and toward the front to totally clear the rear of the vehicle when it's stowed - makes it as easy to dump into pavers, transfers, spreaders, you name it - as if the axle isn't even there. The Strong Arm allows the truck to transform between a short, maneuverable tandem truck and a larger payload truck with much greater length on demand, making the truck more profitable AND more versatile. Work any job a short straight dump truck can work, plus any job a long dump trailer can work. While long dump trailers can haul big payloads, they're often disqualified from short- and mid-range jobs, or any jobs that require turnarounds in tight spaces, because their overall length results in slow back-ups, long dump times, and precarious situations that can bring a job site to a complete stand-still. A Super Dump with a Strong Arm trailing axle can not only work all of those jobs that trailers can't, but it also out-paces trailers even on long-haul jobs. Excellent for Spreading, Wind Rowing, Stock Piling, and Asphalt Paving jobs. The Strong Arm is the only trailing axle that maintains consistent lift force throughout the trip, including when road elevation changes are encountered (like every intersection, every driveway, every freeway entrance and exit, every railroad crossing...). The Strong Arm's unique suspension system, having hydraulic power with gas accumulators, and its patented Secondary Lateral Suspension, provides a soft vertical suspension for traveling over bumps and dips, while enhancing the truck's lateral roll stability. No damaging pressure spikes or drops: Unlike other trailing axles that will see sudden large spikes and drops in hydraulic pressure when traveling over road elevation changes, the Strong Arm can handle even the most drastic inclines and declines, smoothly. These pressure spikes and drops experienced with other trailing axles can cause cracks and failures, not only to the trailing axle itself, but to the truck's chassis and axles as well. LEGAL from load site to dump site: Other trailing axles "solve" their pressure spiking problems by simply not placing any load on the trailing axle, ever. Their trailing axle simply rides behind the truck without actually supporting the weight that it's supposed to, making it no more than a "dummy axle" or "cheater axle", there only to trick law enforcement. Of course, this is illegal and results in the truck owner being fined (yes, law enforcement can tell when there isn't enough load on the axle). With the worst of these "cheater" trailing axles, its tires actually lift off the road surface entirely on a regular basis, with the slightest road elevation change, making it's insufficient lift force blatantly obvious. The Strong Arm doesn't require any such tricks though, and law enforcement encounters are worry-free, because the Strong Arm reliably maintains its legal loading the entire trip. The new Super Dump features a new & improved version of the traditional Strong Arm trailing axle, or a new Strong Arm Air Spring axle. Check out the video to learn about all the latest enhancements. Not all trailing axles are the same! The Maxle, which is NOT a Strong Industries product (but which we do own the right to produce if we were so inclined), is renowned for its loading issues and tendency to break regularly. The Maxle's tires frequently leave the road surface with any road elevation change, which negates its purpose entirely (not only practically, but in the eyes of law enforcement as well). At Strong Industries, our trailing axles are carefully designed and tested to maintain constant lift force throughout all elevation changes, and keep the truck legal your entire trip to the dump site. Our original Strong Arm has a track history spanning decades showing just that. Watch the video below to see several examples of the Maxle's frequent headaches.